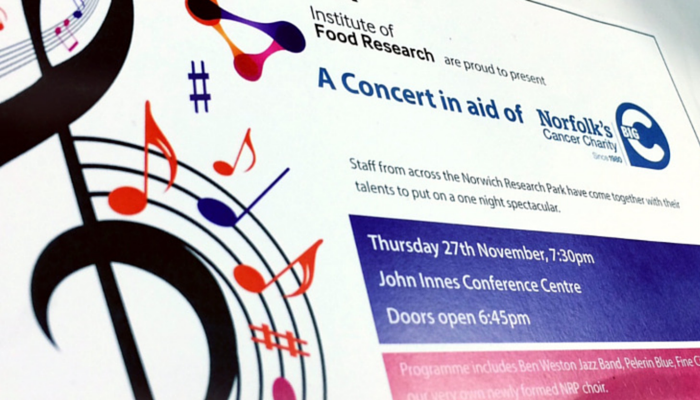 On Thursday 27th November, the Institute of Food Research is hosting a concert in aid of the Big C, a charity that was established in 1980 by two men who were then suffering from cancer and having to travel down to London for treatment, they wanted others going through the same to be able to receive treatment in their local areas. Over 30 years later the Big C has raised over £20 million which has gone towards equipment and much needed research at the UEA. The concert itself is being held at the John Innes Conference Centre which is an independent and international centre of excellence in plant science and microbiology. They help to increase the knowledge we have of plants and microbes which will help benefit agriculture, the environment and human health. The Institute of Food Research is a publicly funded research institute that focuses on food and health science specialising in research into food and cancer. There will be performances by Ben Weston Jazz Band, Pelerin Blue, Fine City Chorus and the newly formed NRP Choir, which is directed by our very own Debs Whomes. Tickets cost £12.50, £10 concession tickets and £5 for under 18s, doors open at 6.45pm, you can find out more information by visiting the Institute of Food Research website.